These documents – well over 120 pages in all -- set out the British government’s plans to reset its armed forces, which it hopes to pay for by increasing from £166 billion to £178 billion equipment spending over the next 10 years. Note that a good portion of this expenditure will simply restore many of the capabilities destroyed by the previous, disastrous 2010 defense review enacted by the previous government, which also was headed by the same Prime Minister. In other words, to pay for all that is promised by Cameron and the MoD, only £2.8 billion will be in the form of extra cash. The rest of the £12 billion increase - or it is £11 billion, as the Treasury says? – will come from “savings” in other parts of the budget: £2 billion from “pay restraint” (i.e., reducing salary increases), £2.1 billion from improved commercial terms in the Equipment Plan (i.e., reducing industry profit margins), and re-prioritisation of £2 billion of existing funding (i.e., switching money around). Finally, £2.1 billion will come from the Joint Security Fund “to fund and deliver the MOD’s SDSR commitments in full, maintaining the current levels of the Armed Forces and building four new submarines to renew the nuclear deterrent.” However, this fund has yet to be created and no-one knows how it will be funded. This is, in fact, one of the more irksome features of this defense review. Statements are made, goals identified, and capabilities wish-listed, without even the most basic explanation of how they will be paid for. A second point that springs to mind when reading the review is that while the promised new capabilities are presented as one entity, they will in fact be implemented over the next 20 or 25 years. More worryingly, as none of these promises are binding, they could easily de dropped, modified or stretched out even further by a new Cabinet. This will be all the easier since the most significant new capabilities are neither priced and have no time-scale, so there is little to suggest they actually have any substance. Take the SDSR’s biggest surprise, that the RAF will buy nine P-8A Poseidon maritime patrol aircraft, and “more than 20” Protector UAVs: no-one can say when they be bought, or with what money, nor when they will enter service. 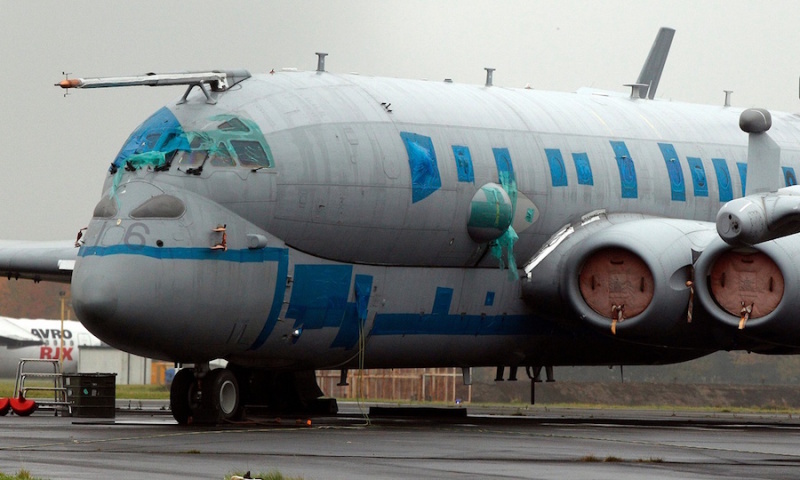 A single P-8 costs about $250 million, so the RAF is looking at over $2 billion once support equipment, spares and everything else is added, for those nine aircraft alone, so it’s not a matter of just shifting funds. In much the same vein, the SDSR mentions the acquisition of a ground-based Ballistic Missile Defense radar; doubling (to £2 billion, the Treasury says) the planned investment in Special Forces equipment; more investments in “advanced high-altitude surveillance aircraft; upgrades to helicopters and transport aircraft, and buying three new logistic ships – separate from the tankers being built in South Korea and which will be delivered from 2016. None of these capabilities were mentioned in previous plans, yet MoD now says all must be paid with the new £12 billion budget increase, whether they require payments in the short term (new Typhoon capabilities) or in the 2030s, like the new class of light frigate that the government pulled out if its hat, not to mention the two new Offshore Patrol Vessels that will be bought to keep the shipyards ticking over and to make up for the five Type 26 frigates that have been cut. The new “Successor” class of nuclear-powered missile submarines is another program which demonstrates the approximations in this SDSR. The estimated cost of replacing the current Trident deterrent force has not only increased by £6 billion, but also requires a new, £10 billion “contingency” fund to meet unexpected cost increases. So that is £16 billion above previously-expected costs, with no explanation of how it will be paid. -- development of an Unmanned Combat Air System (UCAS) with France. Those that we have been able to identify are listed in the table below. that will be paid for by the MoD budget over the coming years. 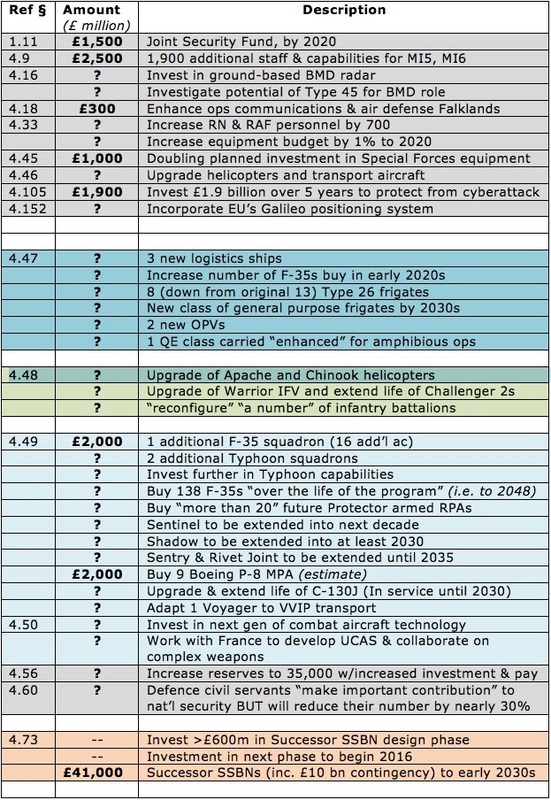 The first column refers to the paragraph of the SDSR which mentions the capability. F-35 fighter: 8, 24 or 138? And by 2020, 2025 or 2048? A very intriguing aspect of the defense review is its contradictory claims about the F-35 fighter. Until last week, official plans called for buying eight F-35Bs, with decisions on the rest sliding to the right. Now, MoD says it will buy an “an additional squadron of F35 Lightning combat aircraft to operate from our new aircraft carriers.” Given that a squadron comprises 12 F-35s, that should bring the total to 20. Yet, the MoD’s SDSR booklet mentions two F-35 squadrons by 2025, with no mention of aircraft numbers, although that implies 24 aircraft. The Treasury’s statement mentions “an investment of £1.2 billion over 10 years to ensure a Queen Elizabeth Class carrier is able to deploy with 24 jets on board from 2023,” but does not say whether that investment is for the carrier, the aircraft, or both. Given that the cost of a single F-35B is currently around $135 million, the 16 additional aircraft (8 have already been ordered, though not fully paid) are expected to cost around £2 billion. The nine new P-8As will also cost an equivalent amount (about $250 million each, plus ancillary costs) so these two programs alone will account for about 40% of the entire spending increase. Much has been made of a short sentence contained in the MoD statement promising “We will maintain our plan to buy 138 F35 Lightning aircraft over the life of the program,” which is perhaps the most misleading outcome of the entire exercise. While many have taken this at face value, it should be noted that there is a long step between the 24 aircraft mentioned in the SDSR and these 138, especially as “over the life of the program” means between now and 2048; which is the official out-of-service date for the British aircraft.